It's been far too long since I've posted. 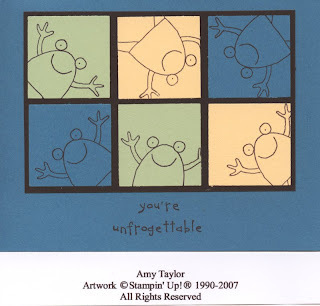 With that in mind, I'm posting a card that I made last year with the Unfrogettable stamp set. 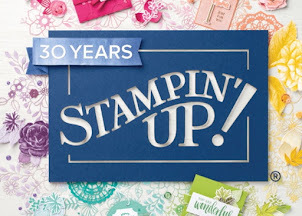 This stamp set is one of the stamp sets that will be retired after August 11th. To make this card, stamp the frog on 3 different pieces of card stock using Basic Black ink. Here I used Certainly Celery, Apricot Appeal and Not Quite Navy. Punch them out using the 1-3/8" square punch, and mount them onto a piece of Basic Black card stock (4-3/4" x 3-1/4"). Mount this on a Not Quite Navy 4-1/4" x 5-1/2" card.